A lovely apartment, a quiet area and a beautiful view on the canal. 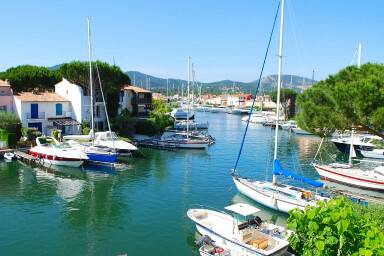 Nice 2-room apartment in a quiet area of Port Grimaud, a few minute-far by walk from the facilities. It is located on the upper floor of a small building and is composed of a living-room with an open-plan kitchen and a sofa-bed, one bedroom with a large bed and a renewed shower-room. On the canal side, a large balcony where you can take your meals or just relax while admiring the lovely view.